My friend Lindsay brought me this bag of Pumpkin Spice Marshmallows last week. She said "make something with these and bring me some". Spray your 9 x 13 bake dish with cooking spray and set aside. Melt butter in a large saucepan over low heat and add marshmallows. Stir continuously until they are melted and combined. Remove from heat and stir in cereal so it is completely coated with marshmallow mixture. Press into your bake dish. Melt chocolate chips with a little tiny pat of butter in the microwave or over a water bath. I prefer the water bath method. To do this find a glass bowl that will fit on a small saucepan. (I use a Pyrex bowl). Put water in the botton of your saucepan, but do not let it touch the bottom of the glass bowl. Place your chocolate chips and a tiny pat of butter in the bowl and heat over low heat. Stir continuously until all the chips are melted. 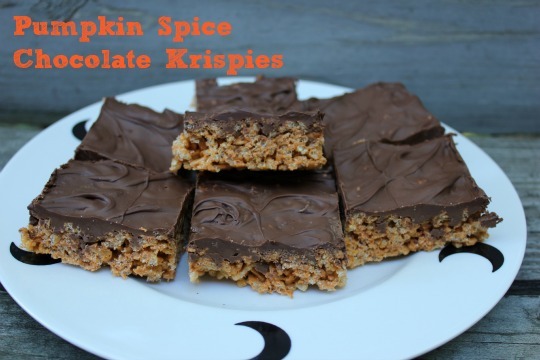 Pour melted chocolate over the rice krispies and spread with a small spatula. I put mine in the freezer for about 5 minutes for the chocolate to set. Cut into square and serve. 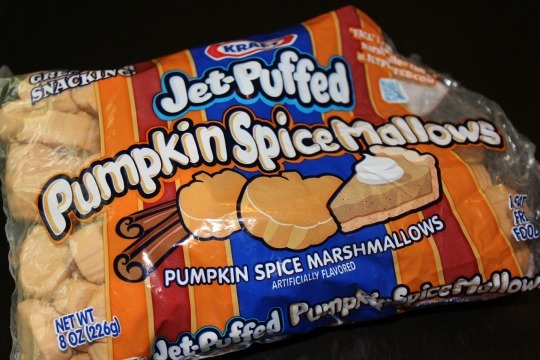 Way to combine my love of RK treats with my love of pumpkin. These look awesome!